We are happy to announce that USC researchers and members of UKRO’s Medical Scientific Advisory Board, Alicia McDonough, Ph.D. and Janos Peti-Peterdi, M.D., Ph.D. were recently honored for their exciting investigative work. Earlier this month, Dr. McDonough delivered the Seldin Award Lecture on “Intrarenal Mechanisms Controlling Potassium and Blood Pressure Homeostasis.” The Seldin Award Lecture was established by the American Heart Association in 2006 to enhance the awareness of the rising epidemic of cardiovascular disease and mortality in patients with chronic kidney disease. In the video below, Dr. McDonough discusses the physiology of the kidneys, how they regulate hypertension, and therapeutic targets. Intravital imaging of podocyte calcium in the intact mouse kidney using multiphoton fluorescence imaging. In these mice the genetically encoded calcium indicator GCaMP3 was expressed only in glomerular podocytes, and its fluorescence is shown in pseudocolor. 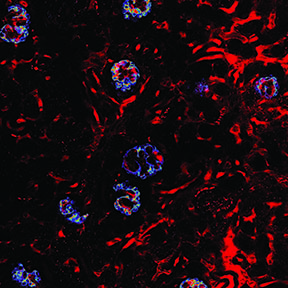 Labeled dextran (plasma dye, red) illuminates the renal vasculature. Also, Dr. Peti-Peterdi just received a new R01 grant from the National Institute of Health. This grant 1 R01 DK100944, entitled “Novel imaging approach to study podocyte function in vivo” will provide $1.5M over the next four years for the Peti-Peterdi laboratory at USC to study changes in podocyte calcium during the development of glomerular disease. The primary focus of this work is to study the role of the so-called P2Y2 receptor, a potential new therapeutic target that is present in podocytes, in primary and secondary podocyte injury. The project will use a new visual approach, intravital multiphoton fluorescence microscopy, which is able to look inside the intact, living kidney, allowing detailed investigation of the molecular and cellular mechanisms of glomerular disease without causing damage. This most recent application of the unique and non-invasive imaging technology was developed in the Peti-Peterdi laboratory at USC to visualize and track the migration and function of podocytes and stem cells within the kidney. Alicia McDonough, hypertension, Janos Peti-Peterdi, podocytes. Bookmark.